Use our Skype-Chat or enter your question and email address in the field below. 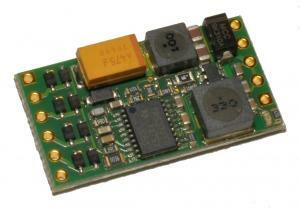 5V/3.3V 500mA Class 1 Power-Over-Ethernet DC/DC Switching Regulator Modul. Power-PoE-1 V1.2 is a Class 1 Power-Over-Ethernet IEEE 802.3af standard compatible voltage regulator module for powering microcontroller modules, boards and other embedded compontents. It is based on a power-over-ethernet PD controller with DC/DC switching voltage regulator and provides an output voltage of 5.0V and an output current up to 500mA. The output voltage can optionally be set to 3.3V. The module has a very compact size of just 28mm x 15mm and was designed as addon board for our popular CrumbX1-NET Embedded Ethernet Module entworfen and the combination provides one of the smallest available power-over-ethernet based embedded internet solutions. An ideally suited platform for the upcoming internet of things! Of course, the Power-PoE-1 module can be used stand alone without the CrumbX1-NET. You can find further information in the Infosheet. Embedded Internet Ethernet Module with AVR ATxmega128D3, CP2201 MAC/Phy, USB. Solderless Bread Board, 830 pins, 5.5cm x 16.5cm. Cable Wire Kit for Solderless Bread Boards, 140 pcs., Plastic Case. (*) Prices incl. VAT excl. shipping. We ship world wide with German Post and DHL. Free shipping above €100 order value (only Germany). PayPal, Wire Transfer. Companies / Institutions in Germany also Invoice. More on this. Wir sind Mitglied im Händlerbund. Erfahren Sie hier mehr darüber. chip45.com is official Atmel AVR Consultant since 2003! Wir möchten unsere Kunden in die Lage versetzen, einfach und schnell neue Technologien einsetzen zu können. Damit ermöglichen wir ihnen, ihre Ideen und Produkte besser und schneller zu realisieren. Wir unterstützen so direkt technische Innovationen und Zukunftsprodukte. Unsere Produkte sind einfach anzuwenden, universell integrierbar und bieten eine aufeinander abgestimmte Kombination von Hardware Komponenten und Software Bibliotheken. Wir entwickeln und verkaufen hochwertige und professionelle Elektronikbaugruppen und Software Tools.